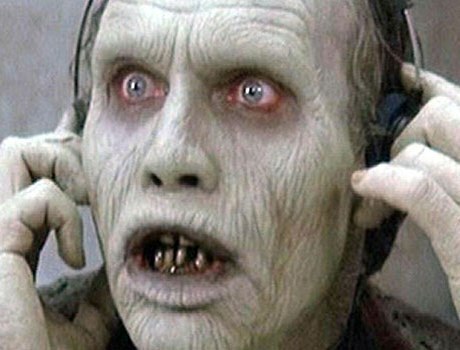 Having its budget cut in half just prior to production, George A. Romero's third installment to the Living Dead trilogy, Day of the Dead , was slightly less consistent than his earlier works, having sharply observed themes and the expected zombie contingent, but a structure that was less than ideal. Still, Romero asserts that this is his favourite film of the trilogy; although, this is presumably because the anti-establishment ethos demonstrated in his earlier works as noted by the dangers of passive consumption was boiled down to core human fault. Rather than point out the behaviours that keep people subjugated, he was examining the root cause. In keeping up with the trajectory of isolating the action, Romero moved his human survivors to an underground military bunk where zombie experimentation and analysis was conducted with the hope of finding a cure or solution to the problem. In setup, Day follows ragtag team of survivors—Sarah (Lori Cardille), John (Terry Alexander), McDermott (Jarlath Conroy) and Miguel (Anthony Dileo Jr)—underground where they find a group of Scientists making zombie domestication efforts. Curious and horrified by the tactics utilized and the minor residual thought process of central zombie Bub, the eventual clash of ideologues between the newcomers and the Scientists is exacerbated by dwindling supplies and the occasional zombie-bite motivated amputation. Beyond the plot, which itself doesn't go anywhere particularly profound and is hindered by poor acting across the board, the focus here is in communication barriers and the inherent human inability to self-assess. Though Sarah points out the frivolity in performing grotesque experiments on the undead to see how they tick, the lead Scientists, Dr. Logan (Richard Liberty) fails to question the cause of the phenomenon with the sort of foresight that could ultimately help save the few remaining members of humanity. What exists here is a cultural subsection defined by defensiveness and an unwillingness to factor in consciousness beyond the self. In such, Romero's ambition and vision here is easily his most vital, thematically mirroring the text of the film to the greater human tendency to focus on symptoms rather than base cause. It's just unfortunate that his vessel for examining this concept is rather flimsy and is executed with less consistency than his previous works.